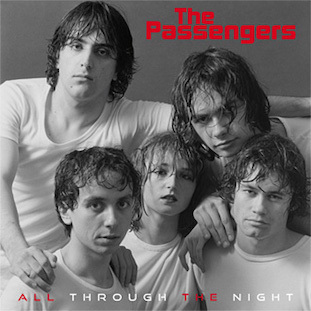 Les Disques du Crépuscule presents All Through the Night, the first of two of newly recorded 7-inch coloured vinyl singles by The Passengers, the late 1970s new wave group from Brussels who subsequently became cult Factory/Crépuscule band The Names. With their first gigs in the five-piece quickly became a local sensation, and in March 1978 won a battle of the bands known as the "First Belgian Punk Contest" - only to reject the prize (a one-off single deal) as a cynical commercial ploy. Instead, the band chose to tape All Through the Night for Brussels punk imprint Romantik Records, only for the label to fold before this came to pass. Cover portrait by Eric de Merkline. Design by Atomluft. Available on 7-inch red vinyl single (includes free digital copy on MP3). Vinyl is limited to 500 copies. All Through The Night is available to buy now via Les Disques du Crépuscule Mailorder.